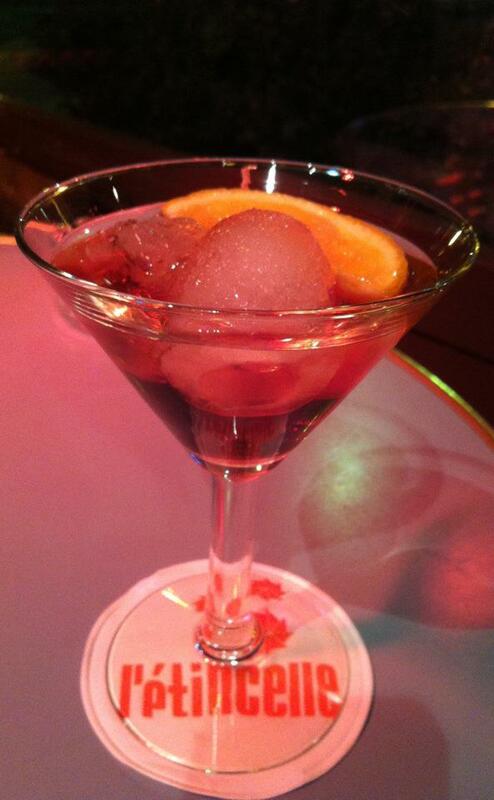 When the waiter returns, he serves up a Martini rouge for Madame … a few ounces of some red liquid served over an ice cube, with an orange slice and a little spoon to swirl the drink and chill it. Her wrinkled-brow look of confusion is soon matched by Monsieur’s when the waiter serves his Martini blanc … a few ounces of some clear liquid over an ice cube with a lemon slice and a little spoon. These unsuspecting Americans take their first sip, and the moment of revelation arrives: they’ve been served … sweet vermouth! 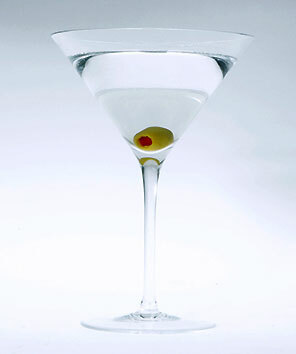 Now, vermouth is an ingredient in a classic martini cocktail, the only question being how much of it to add. You use dry vermouth for a martini, of course, so even when it’s “wet” (with a lot of vermouth), it’s still not a sweet drink. Here in France, however, a “Martini” is simply the vermouth itself (specifically the Martini & Rossi brand)—not at all the American cocktail by the same name. Vermouth has a long history as an apéritif in Europe, especially in Italy and France. While some version of the drink may date back to the Middle Ages in Germany, the first modern production of a sweet, red variety was by the Carpano family in Italy in 1786, and the first dry, pale variety was introduced in France in 1813 by Joseph Noilly. Other early producers who continue to this day include Cinzano (1816), Dolin (1821), and the famous Martini & Rossi (1863). 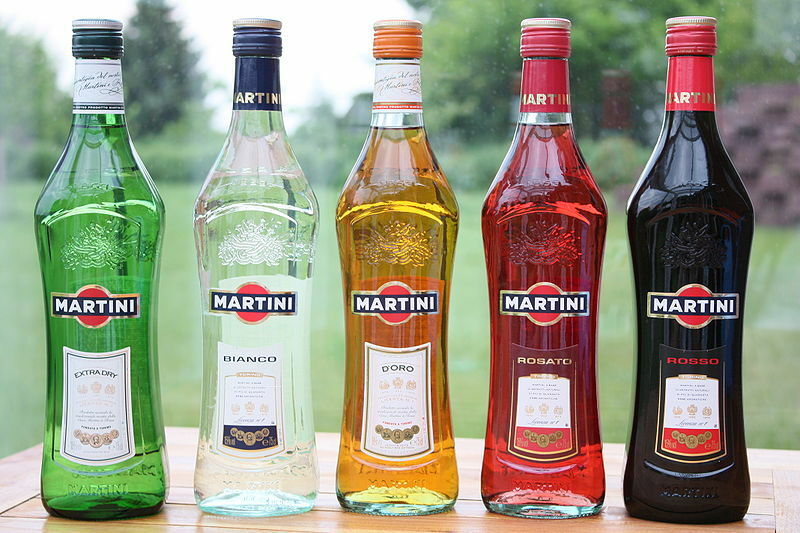 Of Martini & Rossi’s six varieties of vermouth (five of which are shown in the photo below), all are sweet except for the Extra-Dry. The most popular varieties in France are Rosso (rouge or red), with a sweet, slightly bitter flavor, and Bianco (blanc or white), less bitter, with notes of vanilla and spice. I’ve seen Rosato (rosé), with notes of cinnamon and cloves, on the shelves at the local supermarket, but I’ve never seen it on a drink menu here. Apparently, d’Oro (or or gold), with citrus, vanilla, nutmeg, coriander, and honey notes, is marketed in Denmark, Germany, and Switzerland, and Fiero (fier or proud, not pictured), with notes of citrus (especially blood orange), is marketed in Belgium, the Netherlands, and Luxembourg. I’ve never made the mistake of ordering a martini in France, thinking I’d get a very dry gin cocktail with an olive in it, but I do remember the first time I ordered a Martini blanc. Thankfully, I was following someone else’s lead and I knew what to expect ahead of time. For me, a lover of all things sweet, it was a pleasant discovery and the Martini blanc remains my apéritif of choice. It’s the same in Ireland, can’t get a proper martini without explaining to the bar person how to make it! My husband says it’s the same in the UK. In Europe, it seems, martini = Martini and Rossi! Great post, thanks. Why can you no longer buy Extra-dry Martini (in the dark green bottle) in AS France. Cannot find it anywhere. I have to take it out from the UK when I fly. Not sure why, Janet, but it’s true that it’s not very popular here in my experience. I have the impression that dry vermouth isn’t as appreciated as it is in the UK or the US. Ha ha! I haven’t had a good dry martini in a while … I used to drink them all the time, back when I was in my Frank Sinatra-dirty martini-cigar smoking days. Might have to take you up on that martini offer one day! I’m intrigued. What purpose does the spoon serve? Oh, Alida … “and a little spoon to swirl the drink and chill it.” I’ll forgive your skimming the post this time, since you’re distracted by the foxes and does in the yard. 😉 So, when are you coming back to Paris to have a Martini blanc with Michel and me? Bisous, mon amie! But I should add that I made the ASSUMPTION that the spoon is used for that purpose. I can’t imagine another. Given that they serve the vermouth room temperature with an ice cube in the glass, it seems the only plausible reason. Since they don’t give you any sort of receptacle to which you can remove the ice cube, it can’t be to fish it out, right? This is great! I have had the same happen to me in Belgium, France and Switzerland too! By the time I got to other countries, I started to specify that I wanted a gin martini with a twist 😉 In fact, people disagree with me on this topic and believe that a martini is the same all over the world. #passionateaboutmartinis! In Italy, my husband orders a Martini Cocktail, to get what we would think of as a martini in the US.